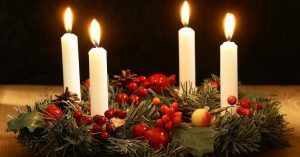 “Advent” from the Latin adventus means the “coming” or “arrival” of the Christ Child and is marked by the four Sundays preceding Christmas, this year starting Sunday, December 2 and ending December 24. It is celebrated in the church calendar as one the most festive seasons of the year. Ironically, the date for the Nativity — upon which our Western calendar system is based — is not known with certainty. The Feast of Christmas was not an early festival for the church, like Resurrection Sunday (Easter) was. Indeed, it did not see general observance until the 4th century. It was not until the early part of the 5th century that the western church agreed upon the current date of December 25 under Pope Leo I, though this date for Christmas was first mentioned in the 4th century illuminated manuscript the Chronography of 354. Some scholars, especially in the eastern church, suggested that the date of Christmas was derived as 9 months after the Annunciation (to Mary) which is celebrated on March 25. This would place the birth of Christ on December 25. Many 18th century scholars, including Isaac Newton, argued that this date was picked to supplant the pagan holiday Saturnalia that was celebrated by the Romans and that many customs survive today: evergreen, holly, mistletoe, feasting, and gift exchanges. More recent historians observe that we didn’t know about many of the customs of Saturnalia until Christian times. We’ll discuss Christmas customs during this series, especially as it relates to the celebration of Yule. December 25, the ancient date for the Winter Solstice, was celebrated as the birthday of the “unconquerable sun” or natalis invicti solis when the sun’s transit was in the lowest point on the horizon with the shortest “day” of the year and then with longer days coming began its transit northward. Under the Christian calendar, the 25th was to become known as the birth of the unconquerable Son.